Despite the fact that the busy weeks of the CCPR I mentioned in a previous post have ended, I have nonetheless been busy with school work. Luckily I was able to enjoy some extracurricular activities last weekend when I had some free time. On Saturday, I volunteered for Pod Camp Toronto 2014 held at Ryerson’s and on the following Monday evening I was able to attend an event put on by the Canadian Public Relations Society entitled Building Media Relationships at the University of Toronto. I thought I would share these experiences with my few readers. Pod Camp’s are “un-conferences” that happen in cities all across North America which bring a diverse mix of professionals from the world of digital media, communications, podcasting and basically anything else related to those fields that attendee’s might find interesting. It’s called an “un-conference” because it is pretty free-flowing and informal. Essentially, if you are someone who has done something interesting and you want to share it to a wider audience, POD Camp will give you some space for a presentation. The first Pod Camp happened in Boston in 2006, and since then they have sprung up in different cities. While they are all alike in their style, each city hosts these events individually, so naturally ours were all local Toronto people. The main thing I can say about Pod Camp is that it is extremely diverse. On Saturday there were talks about: analytics, podcasting, authorship, artificial intelligence and publicity. The best part of all is that Pod Camp is free thanks to generous sponsorship. My main reason for going was to meet some of these interesting individuals, including Samuel Dunsinger who is one of the key organizers. I was also eager to meet some of the other Public Relations students in the cities who are at other colleges. Of course I was able to meet Samuel and a few of my PR cohorts from Seneca College, all of whom were very friendly. I also had the pleasure of using a new Microsoft Surface Tablet (they are pretty slick) and get a good look at a 3D printer! Lastly, I was hoping to meet some PR Professionals who I could rub elbows with. Even though I had pre-greased my ‘bows, I wasn’t able to rub them on anybody. Fortunately I was able to attend a talk about getting publicity put on by Daniela Syrovy, the President of Clutch Public Relations, a boutique PR agency in Toronto. She runs a small firm and in my opinion is pretty much living the dream. Her talk was mostly about the need for small businesses to use Public Relations tactics to help their sales. She emphasized the value of PR over advertising and stressed the importance of tailored and short press releases that will gain wide attention. In many ways she reiterating lessons I had already learned in class, but it felt validating to hear them again. One thing I would like to point out is how awesome her work sounds. I assume the dream for many communicators is to eventually run their own agency where they can pick the clients they want to work with. When an audience member asked about facing difficulties in getting her clients good press, she confidently replied that all of her clients were awesome, and she only works with clients she truly believes are awesome. Since her main clients are in the Arts and Film industry, I’d say she is right. Obviously there were lots of interesting presentations, but there are two that I would like to share. First, Anthony Marco, an educator and podcaster gave an interesting presentation on how to create an authentic voice. He was an excellent and engaging speaker who gave a pretty brief overview of how speaking for a podcast is fundamentally different from other forms of media. He pointed out the intimacy that exists in a podcast between the speaker and the listener, how it is an individual experience for each member of the mass audience. He also was really admirable for the fact that he is doing what he loves. He does all sorts of podcast on pretty nerdy topics, but you can tell he is passionate about his work (or hobbies). His audience was quite involved and asked many questions, which he happily answered. While I don’t currently podcast, it is something I would like to do in the future and I’m sure I’ll keep his advice in mind. One of the best things about being a student again is getting the student discount for professional societies. When I was working in Communications previously, I wanted to join one of them, but wasn’t prepared to pay the steep member price. Just a few weeks ago I was minted as a student member of the Canadian Public Relations Society. Naturally I was eager to attend any event that brought me together with others in the industry. 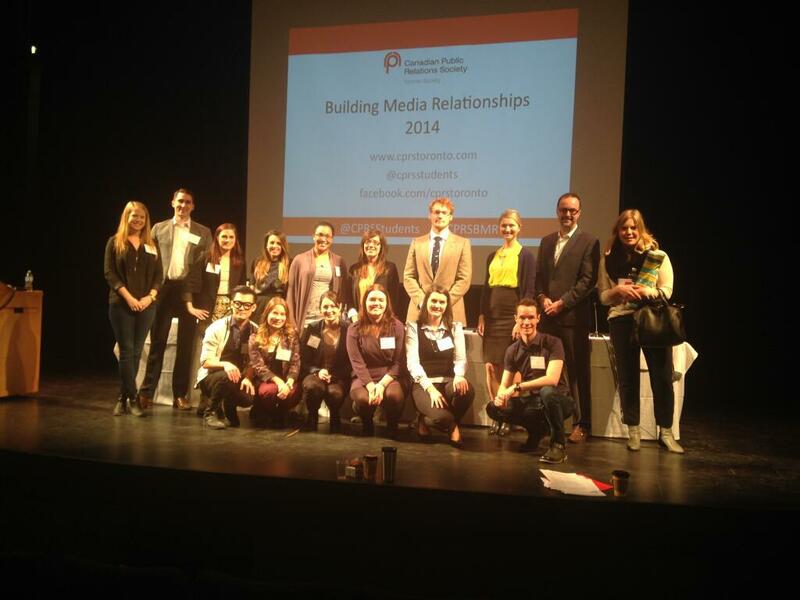 On Monday night CPRS Toronto hosted a seminar for students entitled Building Media Relationships. The panel included two journalists and three public relations professionals: Carly Weeks from the Globe and Mail, Katia Ostapets from FAJO Magazine, Kelly Baita from Strategic Objectives, Robin Smith from National PR, and Nina Kalos of Veritas PR. This panel was diverse as Carly Weeks writes on Health, Katia writes on Fashion Events, Robin respresents technology clients, while Kelly and Nina represent a wide range of consumer clients. I really enjoyed having the opportunity to hear questions answered from both sides of the industry. As a PR student, I am always getting valuable advice from my profs who were former PR professionals, but we don’t get to hear the opinions of journalists. It’s nice to hear the opinions of journalists at the same time as PR folk. One of the best things I took away from the panel was the kind relationship Journalists and PR people have. I naturally assumed they antagonized each other, but each of the speakers really enforced the need to create friendships above and beyond the professional relationship. I have to admit that the attendance was a little dismal given the amount of PR students and young professionals within the Toronto industry. I figure any opportunity I have to interact with industry-types outside of the classroom is something I should capitalize on. I hope CRPS keep hosting these type of events that support students who require all the help they can get. Don’t miss PODCamp next year, and be sure to keep an eye out for CPRS events folks, you may live to regret it. This entry was posted in PR and tagged #CPRSBMR, #PCTO2014, Canadian Public Relations Society, Clutch PR, CPRS, National PR, Pod Camp, Pod Camp Toronto, Public Relations, Strategic Objectives, Veritas PR on February 27, 2014 by The Benign Propagandist.